Please read user agreement (Terms and Conditions, amended as of July 21, 2011) before using this service. 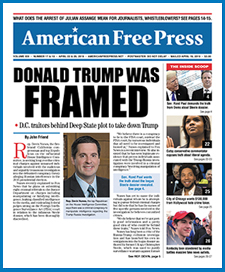 By continuing to use americanfreepress.net, you agree to abide by the conditions of this agreement. Quantcast–To track and log user actions for advertising purposes. DoubleClick–To track and log user actions for advertising purposes and managing ad operations. AppNexus–To track and log user actions for advertising purposes. Facebook Impressions–To measure effectiveness of advertising. Disqus–To enable comment and discussion features on our website. Typekit by Adobe–To enable certain website features. Google Analytics–To measure effectiveness of advertising and users’ interaction with content. Yahoo Analytics–To measure effectiveness of advertising and users’ interaction with content. Alexa Metrics–To measure effectiveness of advertising and users’ interaction with content. Quantcount–To track and log user actions for advertising purposes. Facebook Connect–To enable functionality with social media features. RevContent–To track and log user actions for advertising purposes. Google Publisher Tags–To track and log user actions for advertising purposes and managing ad operations. Pinterest–To enable functionality with social media features. Facebook Social Graph–To enable functionality with social media features. Twitter Syndication–To enable functionality with social media features. Addshoppers–To enable functionality with social media features. Google Adwords Conversion–To measure effectiveness of advertising. Facebook Custom Audience–To track and log user actions for advertising purposes. Google Tag Manager–To manage cookies and tags on our website. Twitter Button–To enable functionality with social media features.